NMSBA News also include the Neuromarketing Yearbook that will be published for the 1st time in March 2014, the announcement of the Neuro Talent of the Year Competition and the next Neuromarketing World Forum that will take place in New York, on 5-6-7 March 2014. Developments section written by Mirjam Broekhoff and entitled “ARF’s Neuro 2: Clarifying the Need for Neuroresearch“, covers the work of Harst Stipp (Executive Vice President Research and innovation, Global and Ad Effectiveness at the Advertising Research Foundation) for supporting the relevance and significance of neuroscientific studies to the field of advertising and communication (projects Neuro 1 and Neuro 2). These projects have been designed to help advertisers by answering questions like “Can neuromarketing research methods create more effective ads compared with traditional testing methods?” or “Which neuroscience methods best predict the effect of the ad on sales?”. For Neuro 2 project, there were used 37 commercials, each evaluated using traditional (subjective evaluations), implicit association measures, eye tracking, biometric measures (ECG, SCR), EEG and fMRI. 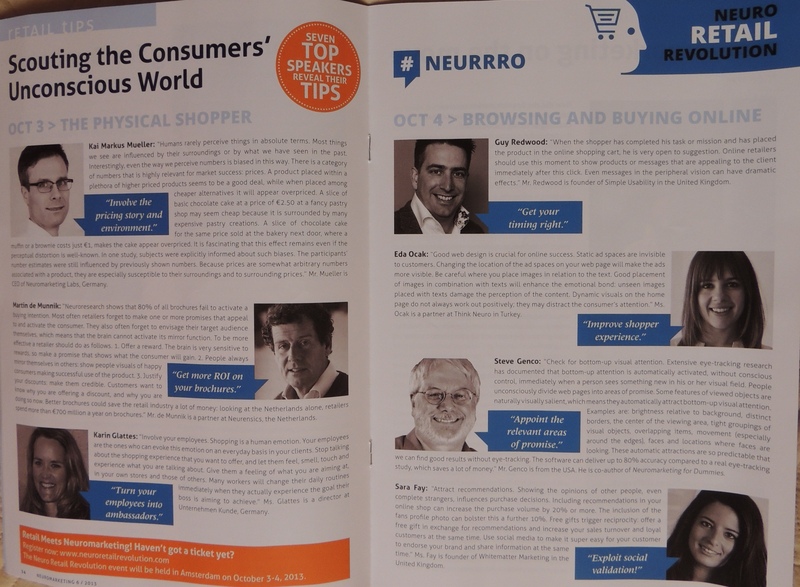 More about this will be covered at Neuromarketing World Forum 2013. 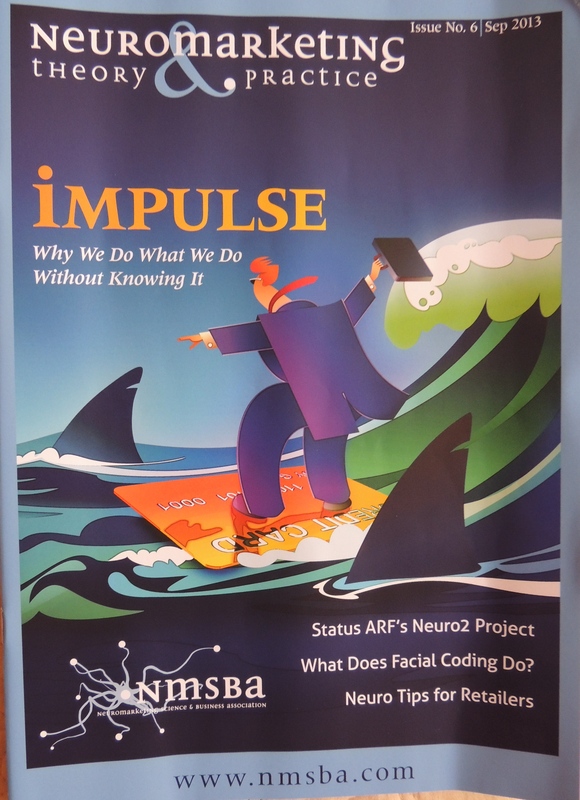 Trend section “Online Facial Coding: Is It Here To Stay?” contains the opinions of Rafal Ohme (NeuroHM), Graham Page (Millward Brown) and Peter Lewinski about the use of facial coding and it’s future. This issue presents the book review of Neuromarketing for Dummies by Stephen Genco, Andrew Pohlmann and Peter Steidl (reviewed by Monica Olteanu (Bercea)), which is the most comprehensive neuromarketing guide published until now. This issue’s Members Spotlight is focused on Paco Arribas (Co-Founder of Inside Brain), who is interviewd by Ana Iorga and talks about how his companyprovides personalized solutions for each client, combining different neuromarketing techniques. Sentient, an interesting tool to sense emotions is presented by Enrique Leon (Director at Health Division of Tecnalia, Spain). This is a software able to detect emotions that are engaged by particular stimuli. Cognitive Dissonance in Marketing is also covered, as Werner van Zyl emphasized it’s importance and gives advices. Research update section presents the work of Emily Falk (using fMRI) on What Makes Effective Promoters and the neuroscientific aspects of “buzz”. This and more insights you will find in the latest issue of Neuromarketing Theory & Practice Magazine. This is the only publication in the world that is covering news and insights from the neuromarketing industry, interviews with leaders from the field, and covering relevant research from consumer neuroscience and neuro economics. This magazine is the result of the efforts made by the Director of the association (Carla Nagel), the editorial board (Fabio Babiloni, Phil Barden, Neale Martin, Rafal Ohme, Anna Thomas, Leon Zurawicki) and NMSBA members and contribuitors. Congratulations to Mirjam Broekhoff (Chief Editor) for her work and high standards, I am looking forward to the next editions and developments! Earlier Issues: Issue 1 (April 2012), Issue 2 (July 2012), Issue 3 (November 2012), Issue 4 (January 2013), Issue 5 (April 2013).